Following the defeat of the Jacobites at Culloden and the eventual end of the ’45 Jacobite Rising came the Dress Act of 1746 which essentially banned the wearing of ‘Highland Clothes’ by anyone, as of 1st August 1747. From this stems the belief, by some, that this meant the banning of tartan, but, is this fact or fiction? To be able to answer this question we need to look back to the full history of this Act which starts a good while earlier than 1746. To understand the Dress Act you have to consider it not as a singular entity but part of a much larger history. First, it is wise to look at the Disarming Act of 1716. After King George I took the throne in 1714, as the first Hanoverian king, there followed the 1715 Jacobite rising. This Rising saw over 12,000 Jacobites take up arms against the King but were eventually defeated. The aftermath saw harsh penalties against the Jacobites in an attempt to prevent them regrouping and challenging the throne again. The Disarming Act was an attempt by the Government to limit the strength of the Jacobite men. Unfortunately, for the Government, the Act was very ineffective. While those loyal to the King may indeed have handed over their weapons, for those not loyal the Act pushed them further away and many hid their weapons and handed over old rusted blades that were of no use anyway. In 1719 the Jacobites tried again with a short lived Rising and this led to the Disarming Act of 1725 which was ‘An act for the more effectual disarming the highlands in that part of Great Britain called Scotland; and for the better securing the peace and quiet of that part of the kingdom‘ This time General Wade led the movement and was more successful in seizing weapons with some suggesting he managed to gather roughly 2,500 weapons, but still many families hid their swords and guns away from the Governments eyes. So, in 1745 there were still Jacobites ready to come and support Prince Charles Edward Stuart. Following their eventual defeat the Government took clear steps to ensure that there would be no hope of any further risings. In 1746 they brought out the Act of Proscription. This was similar to the Disarming Act but the penalties for not conforming were more severe and it is under the Act of Proscription that we find the clause that became known as The Dress Act. The Dress Act stated that ‘That from and after the first day of August, one thousand seven hundred and forty seven, no man or boy, within that part of Great Briton called Scotland, other than shall be employed as officers and soldiers in his Majesty’s forces, shall on any pretence whatsoever, wear or put on the clothes commonly called Highland Clothes (that is to say) the plaid, philibeg, or little kilt, trowse, shoulder belts, or any part whatsoever of what peculiarly belongs to the highland garb; and that no tartan, or partly-coloured plaid or stuff shall be used for great coats, or for upper coats’ Anyone found breaking these rules could be imprisoned for six months, and, if they were caught again, they could be sent to a plantation overseas for seven years. So, here we can see that the Dress Act does not completely ban tartan as many people believe, it only banned it for certain parts of clothing. Also, it is worth remembering the ban did not apply to men serving in Highland Regiments or to the Gentry, sons of Gentry or women and according to the Act it only affected Scotland. The Act did however affect men who had fought for the Government army as well as the Jacobite army. So, even if you fought for the Government they could still arrest you for breaking the Dress Act making it much more than just an action against Jacobites. It wasn’t until 1782 that the act was repealed on 1st July. However, it would take many further years before the Highland dress returned to the mainstream and even then it was worn by many more for occasions and not as everyday wear. We hoped you enjoyed this little insight into the Dress Act and as always please like, share, comment, tweet and keep joining us for more titbits. The name ‘Tartan’ would be unknown to ancient Highlanders as the true Gaelic word is breacan which derives word breac meaning chequered. By changing the colours; varying the width; depth; number of stripes, different patterns can be formed. Tartan patterns are called “setts”; the sett being the complete pattern and a length of tartan is made by repeating the pattern or sett over and over again. To form a tartan pattern there were normally six main stages: gathering the wool, preparing the fibres by combing it to the desired texture for soft or hard tartan, and spinning by a method involving a drop spindle, or distaff and spindle, in which the yarn or thread was spun by the fingers and wound round the bottom of the spindle. (This was later replaced by the spinning wheel, and ultimately by modern machinery.) The wool was then dyed, woven and finally stretched. This last stage, also known as waulking, was often accompanied by singing, during which jokes would be made about friends, frequently in impromptu verses; a tradition that has continued into modern times in the Harris-tweed industry. Tartans were originally often distinctive within a geographical area and were thus territorial. It is said that a man’s plaid with its unique pattern of colours and stripes would tell you where he was from. Tartans for everyday wear were often brightly hued so for hunting and similar pursuits a duller brown-hued tartan would be worn. 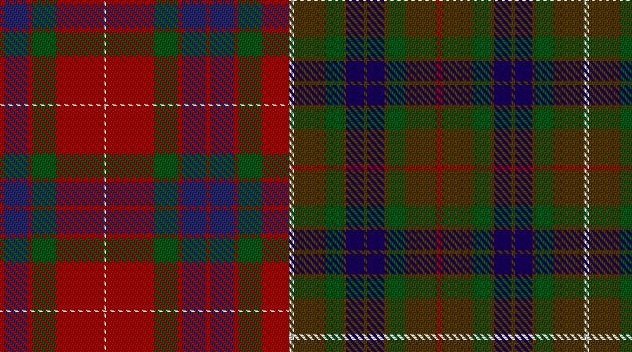 These hunting tartans were typically created by substituting the red of the dress tartan for brown. However, in some clans the everyday tartan was already a dark hue e.g. Mackenzie and thus the same sett was worn for hunting. 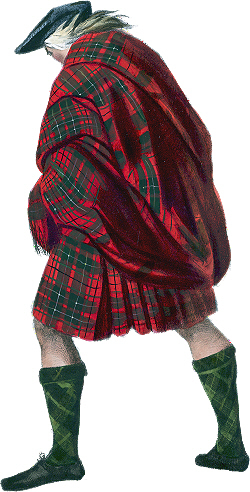 In some clans there was also a special ‘chief’s tartan’ worn by the chief and members of his family only. In 1747 after the Battle of Culloden the act of wearing tartan was banned under the Act of Proscription in an attempt to crush the clan system of the Highlands and prevent further uprisings. 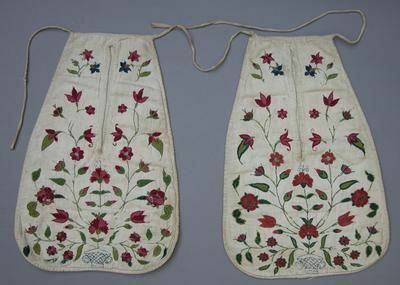 Penalties for wearing Highland dress included imprisonment for six months for a first offense and if caught again the possibility of being transported. It wasn’t until the act was repealed in 1782 that tartan began to re-emerge and during the 1822 visit of King George IV to Edinburgh Sir Walter Scott popularized tartan for the masses. 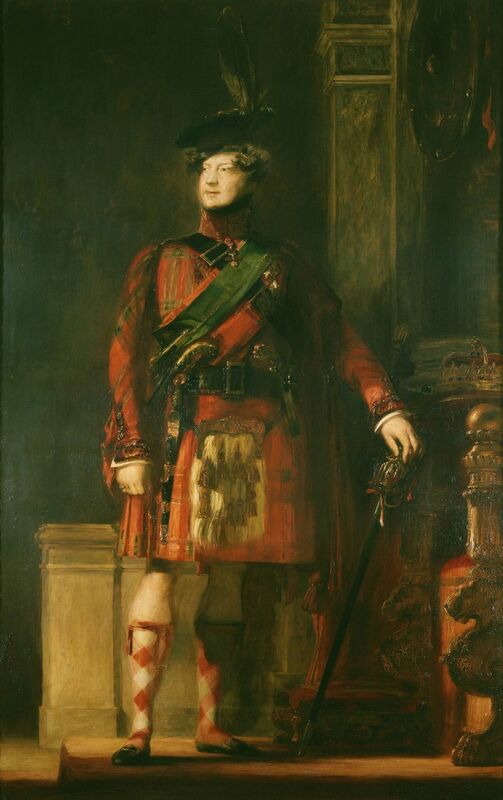 During the visit Highland Chiefs were persuaded to attend in their Clan tartans and the King himself wore a red tartan outfit which later became Royal Stuart tartan. Tartan suddenly became fashionable and families, who probably had never before worn tartan, became the proud possessors of family tartans as they looked to connect to romanticized history of their past. Tartan along with clan cap badges now became an ideal dress for instilling traditional pride in each clan and helped preserve the clan as a tribal community at a time when modern and industrial changes were tending to minimise tribo-familial activities. 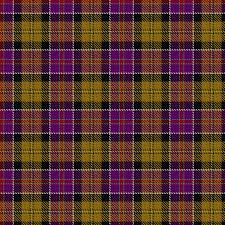 Typically it would be the chief’s tartan that would become the clan’s tartan with the simpler designs dying out. The types of garment also changed. Originally men would have worn a traditional plaid (a single long piece of cloth belted at the waist and wrapped over the shoulder) but the kilt worn today is the little kilt, the feiledh bheag (meaning the ‘little fold’), from which the anglicised word ‘philabeg’ derives. This garment originally had large box pleats that were stitched; while the neat tight pleats of today’s kilt are the result of military influences in the nineteenth century. Hopefully you’ve enjoyed this brief spiel about tartan, we haven’t covered it all by a long shot but hopefully it’s piqued your interest. As always please like, share, tweet, comment and maybe even find your own family tartan.